There are real boundaries beyond which our society and system of government can and will break down. There is a minimum level of solidarity required for a nation to survive with citizens rather than subjects, and a minimum level of social stability required for it to function. We can fall too far and merely avoiding disintegrating society is not enough. We must do far better, for ourselves, for the world, and for the future. Swatting is not a “dangerous hoax”. It is not a “prank”. Swatting is attempted murder — in this case, successful murder. The police are not the target of swatting — they don’t receive the call and possibly break their station with their breach equipment or shoot each other. The innocent people at the address the SWAT team is sent to are the target; they are at risk of property damage at best and getting shot by police at worst. The swatter is sending 10-60 officers, mostly lethally equipped and expecting a dangerous situation, sometimes including snipers, to the swatting target’s address. This can reasonably be expected to eventually and occasionally lead the the death of the swatting target. 72.11 million cars and 22.53 million commercial vehicles were produced in 2016. Fewer than 1 million of those vehicles produced were electric. An astounding amount of battery production is being constructed, mostly for electric vehicles but also for grid-scale power storage. 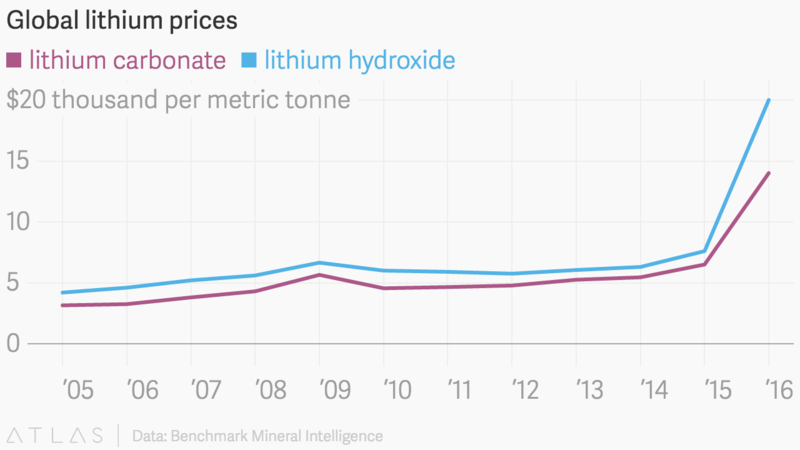 Where is all that lithium for lithium ion batteries going to come from? This is not a chart that looks like lithium production is being aggressively expanded. How much is that lithium going to cost? How much lithium carbonate is used in a lithium-ion battery? Less than 1 kg per kWh.